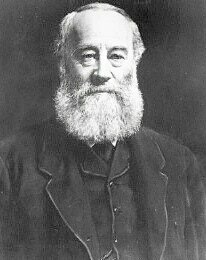 English physicist, was born on the 24th of December 1818, at Salford, near Manchester. Although he received some instruction from John Dalton in chemistry, most of his scientific knowledge was self-taught, and this was especially the case with regard to electricity and electro-magnetism, the subjects in which his earliest researches were carried out. From the first he appreciated the importance of accurate measurement, and all through his life the attainment of exact quantitative data was one of his chief considerations. At the age of nineteen he invented an electromagnetic engine, and in the course of examining its performance dissatisfaction with vague and arbitrary methods of specifying electrical quantities caused him to adopt a convenient and scientific unit, which he took to be the amount of electricity required to decompose nine grains of water in one hour. In 1840 he was thus enabled to give a quantitative statement of the law according to which heat is produced in a conductor by the passage of an electric current, and in succeeding years he published a series of valuable researches on the agency of electricity in transformations of energy. One of these contained the first intimation of the achievement with which his name is most widely associated, for it was in a paper read before the British Association at Cork in 1843, and entitled "The Calorific Effects of Magneto-electricity and the Mechanical Value of Heat," that he expressed the conviction that whenever mechanical force is expended an exact equivalent of heat is always obtained. By rotating a small electro-magnet in water, between the poles of another magnet, and then measuring the heat developed in the water and other parts of the machine, the current induced in the coils, and the energy required to maintain rotation, he calculated that the quantity of heat capable of warming one pound of water one degree F. was equivalent to the mechanical force which could raise 838 lb. through the distance of one foot. At the same time he brought forward another determination based on the heating effects observable when water is forced through capillary tubes; the number obtained in this way was 770. A third method, depending on the observation of the heat evolved by the mechanical compression of air, was employed a year or two later, and yielded the number 798; and a fourth -- the well-known frictional one of stirring water with a sort of paddle-wheel -- yielded the result 890 (see Brit. Assoc. Report, 1845), though 781.5 was obtained by subsequent repetitions of the experiment. In 1849 he presented to the Royal Society a memoir which, together with a history of the subject, contained details of a long series of determinations, the result of which was 772. A good many years later he was entrusted by the committee of the British Association on standards of electric resistance with the task of deducing the mechanical equivalent of heat from the thermal effects of electric currents. This inquiry yielded (in 1867) the result 783, and this Joule himself was inclined to regard as more accurate than his old determination by the frictional method; the latter, however, was repeated with every precaution, and again indicated 772.55 foot-pounds as the quantity of work that must be expended at sea-level in the latitude of Greenwich in order to raise the temperature of one pound of water, weighed in vacuo, from 60 to 61 F. Ultimately the discrepancy was traced to an error which, not by Joule's fault, vitiated the determination by the electrical method, for it was found that the standard ohm, as actually defined by the British Association committee and as used by him, was slightly smaller than was intended; when the necessary corrections were made the results of the two methods were almost precisely congruent, and thus the figure 772.55 was vindicated. In addition, numerous other researches stand to Joules credit -- the work done in compressing gases and the thermal changes they undergo when forced under pressure through small apertures (with Lord Kelvin), the change of volume on solution, the change of temperature produced by the longitudinal extension and compression of solids, etc. It was during the experiments involved by the first of these inquiries that Joule was incidentally led to appreciate the value of surface condensation in increasing the efficiency of the steam engine. A new form of condenser was tested on the small engine employed, and the results it yielded formed the starting-point of a series of investigations which were aided by a special grant from the Royal Society, and were described in an elaborate memoir presented to it on the 13th of December 1860. His results, according to Kelvin, led directly and speedily to the present practical method of surface-condensation, one of the most important improvements of the steam engine, especially for marine use, since the days of James Watt. Joule died at Sale on the 11th of October 1889.